It’s always an incredible feeling to reach your goal and Laura Weyler’s new J/88 team Hijinks is relishing in that feeling. Hijinks won the 2017 J/88 North American Championship after a hard fought season. Quantum’s Kris Werner helped the team to their title, but even the team on top learns a few things along the way. Here’s what he and the team took away from the NAs in hopes it will help your program. Let's go surfing - Team Hijinks surfs downwind at the J/88 North Americans. Photo by Tim Wilkes. 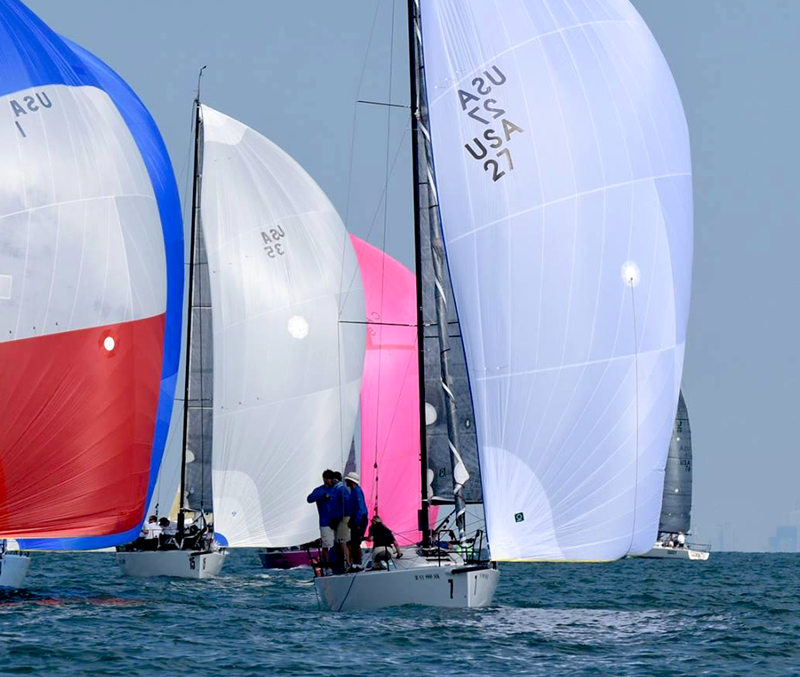 In the fall of 2016, new J/88 owner Laura Weyler approached me with the goal of going to the 2017 Quantum Key West Race Week. I set the wheels in motion and not only did we make it and have a great time, we won our class (you can read about our journey and prep here). 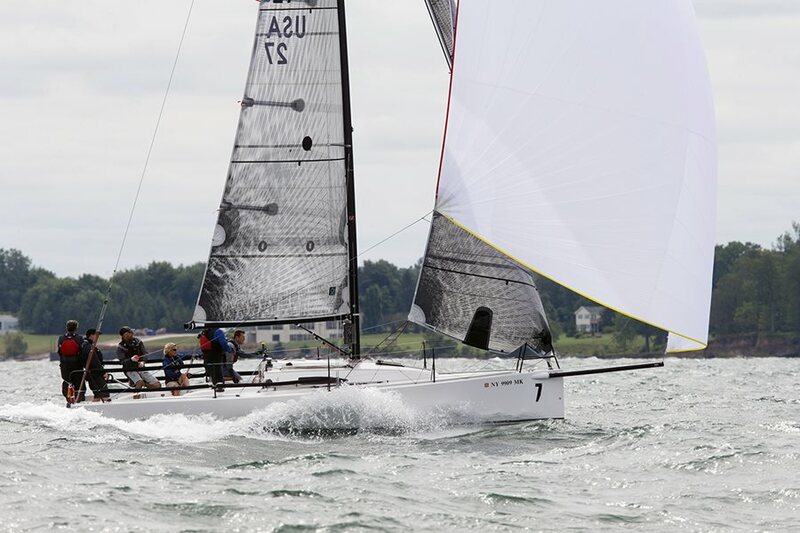 With our first major regatta under our belts and a taste for the podium, we set our sights on the next big challenge: the J/88 North American Championship. We set out with a goal of improving each regatta and we knew we had to be as prepared as possible to win the NAs. Our preparation paid off and we came home with another first place standing. However, it wasn’t without a lot of learning. Here’s a glimpse into the 2017 event and what we learned. “You can’t win the regatta on the first day, but you can lose it.” This overused cliché defined our plan for the day: Stay conservative and don’t take any big risks. The forecast was calling for good breeze, and we certainly got that. 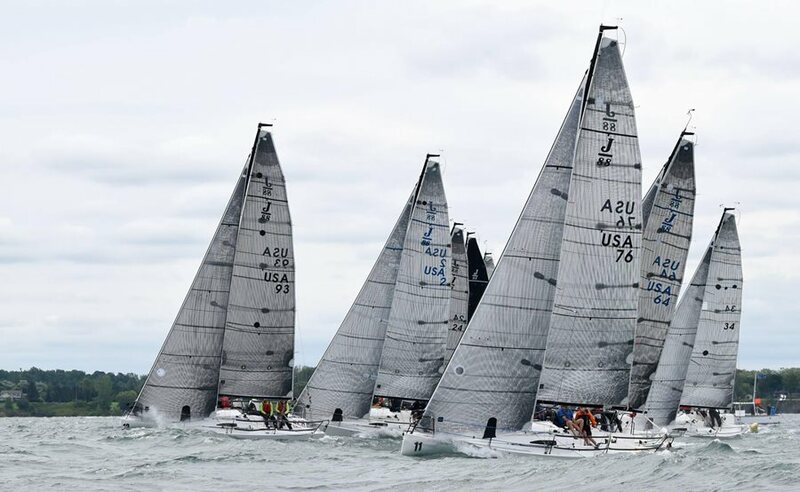 The size and period of waves as the boats motored out of the Niagara River and onto Lake Ontario may have surprised some of the teams who thought that lake sailing was always flat water sailing. With nearly 150 miles of fetch and a strong easterly, we had some pretty big waves. Since we had mostly local sailors on Hijinks, we had the proper gear and were prepared for the long and slow motor into the waves and out to the race course. Winds were about 15 to 22 knots, waves were four feet to six feet, and we quickly went upwind and down checking our settings, checking our gear, and making sure we had an idea of what the wind and current were doing. Yes, there is current on Lake Ontario. Heavy wind starts - Quantum teams lead the fleet in a heavy wind start at the NAs. Photo by Chris Howell. In the first race, we got off to a mediocre start and faced our first taste of adversity by being forced to the wrong side of the course on the first beat. Our team showed incredible poise, and we remained calm and focused on making the boat go as fast as possible and gaining ground anywhere we could. Rounding the weather mark in seventh or eighth place was not exactly the start we were looking for, but the team members stayed focused on their jobs and we gained back four or five boats on the first downwind leg. This gain allowed us to have more options on the next upwind and go where we wanted to without being dictated to by the lack of clear lanes ahead. By the next weather mark, we were in second place. With a small foul-up by the lead boat on the run, we made a quick gybe and surfed in for the win. It may sound vain or a bit silly to be talking about a bad start or a lower mid-fleet first weather mark in Race one, but with all the expectations heaped onto North Americans or a big event and the fact that you really never know how many races you may end up getting in, it is easy to come unglued and lose sight of the big picture, which is never to give up being 100 percent focused--regardless of fleet position--and stick to doing the best job you can. After the confidence boost from our comeback, our team really felt good, and we kept the pedal down for the rest of the day, finishing with a 1,1,3,1. This was a fantastic score line by any measure, and we hit 21.1 knots on one of the downwind runs surfing some nice waves. There were differing opinions on the forecast and whether it would be another heavy air day with waves or a more moderate one. Lesson #1 taught us to leave the dock earlier than we did on the first day so that we could be the first boat out to the course. Being prepared and understanding the race course and conditions brings confidence to a team. The wind started out in the 15-knot range with some nice large waves from the same wind direction. In the first race we made the mistake (My mistake really!) of being too tight on the rig, and, coupling that with a below average start, we found ourselves feeling very sticky and struggling to pass boats. We sailed tactically smart to a hard-fought fifth place, which felt more like a 10th place due to how bad the boat felt by being underpowered in leftover waves with much lighter wind than we set up for. When you are sailing around pre-start and observing the course, set your boat up so it feels good for the lightest breeze that you have seen on the course or that you predict to occur. It’s easier to depower the sail plan a little than to find power with a very tight rig or perhaps a smaller, less powerful sail. I thought I had learned that lesson at least a 100 times, but I guess I needed 101 times for it to finally sink in! Leading the pack - Hijinks taking the cake downwind. Photo by Chris Howell. For Race 6, the second of the day, I erred on the lighter side with the rig tune and it paid off as the breeze got even lighter during the race, forcing the RC to shorten course on the last two legs. In variable and tricky conditions, we certainly could not complain about a second place finish. We did not win the day in points, but we learned some lessons and were still ahead in the regatta. We went into the third day with an eight-point lead over second place. With our fifth place being our current throw-out race, we felt good but not overly confident. 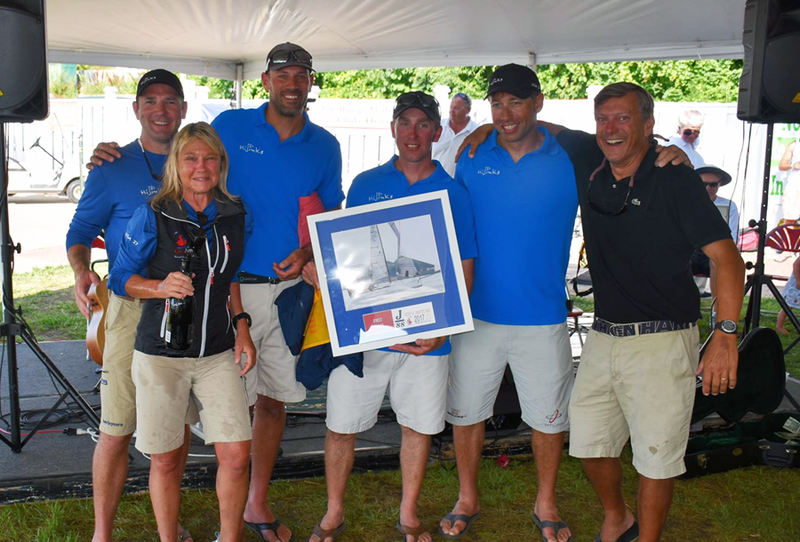 All the hard work our team had put in toward our goal of winning the NAs had paid off, as all you can ask for is a chance to win the regatta on the final day of racing. The forecast was for light air, five to seven knots, and from an unfamiliar direction to our local team, so we knew just about anything could happen. As the pre-race routine unfolded, much of our discussion focused on crew positioning for optimum boat speed. In our minds, the most important factor was staying in the best pressure as long as possible. We set the rig to its lightest setting and formulated a plan of attack. We did not feel like we were sure of one side of the course over another, although our hunch was that the left side would be good. With some current in the mix as well, we decided a conservative start near the boat third of the line (I like to break our start strategy into thirds: pin third, middle third, and boat third.) would be appropriate to have the most options and least chance of getting pinned to one side, a situation that would be hard to recover from. At the helm, Adam had a nice start that allowed us to continue sailing off the line on starboard without getting squeezed off and sent away from the fleet and to the right side where we had less confidence in more pressure. As we continued to sail on starboard, we noticed that one or two boats behind us had tacked out to the right and seemed to have a good pace and a slight right shift. The boats to the left were “bow down,” looking like they might be getting left shift. However, the wind looked lighter to the left. It was the classic decision: “go for pressure” or “go for the shift.” In the very light conditions we had, we chose pressure. Once we felt like we had just enough leverage to not give up more than two or three boats to the left, we tacked out to the right and found better pressure. I know that I hate to go below and feel bad asking anyone else to do it, but sometimes you just have to take one for the team and know that you are helping to make an impact. Team Hijinks - Left to Right- Kevin Morgan, Laura Weyler, Kris Werner, Adam Burns, John Goller, Peter Doyle. A special recognition to Phil Hasl who was a big part of our success but couldn’t make the NAs! With our decision to send two crew members below, to leeward (keep weight over the keel/down low), and to move everyone as forward as possible (I was trimming main and handed off the mainsheet to Adam and moved up toward the companionway), we seemed to have another gear of light air speed. Not only did this allow Adam to easily handle the minor adjustments needed in light air and feel the mainsheet a bit more like a dinghy, but it also allowed me to concentrate 100 percent on “head out of the boat” and communicating with the crew on finding pressure and making the correct tactical choices in what were extremely challenging conditions. There are some boats where this is not practical or possible, but the smaller the boat the more important this becomes. With great speed and the crew fully prepared for light air, we managed to win the race and then followed up with another win in Race 8. Two wins in very light and tricky conditions was satisfying, given all the time we spent being razor focused. It was a total team effort. After we tallied up our scores and total points with our competition, we realized we did not need to race the final race and could use the DNS as our throw-out. We had won the NAs with a race to spare! At any level of sailing these things don’t happen very often. It felt great to savor the win and enjoy the hard work that had paid off. I feel very lucky to have been part of such a great and talented team and am so thankful for the trust Laura Weyler extended by having me and Quantum sails aboard her boat. Click here to view the full results and learn more about the event.